All aboard the ABC Train! 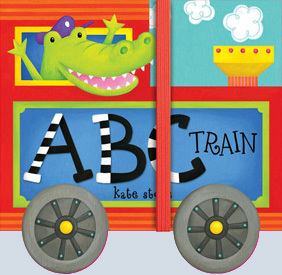 This charmingly illustrated, train-shaped board book introduces toddlers to the letters of the alphabet and some fun examples of words that start with each of them. This little locomotive is part board book, part favorite toddler toy. This chunky little block of a book features sturdy, accordion-style construction that allows it to unfold into a yard-long train that kids can play with while they're learning. One side of the train features all the letters of the alphabet, each with a corresponding illustration, while the reverse side features a mix of the illustrations for a fun learning game. An elastic closure completes the package, keeping everything neat and tidy. 12 pages, 4½ x 4½”. Ages 3 - 5 years old.